Daly Waters—don’t forget your thongs | Where to next? Daly Waters was one of my favourite stops as we travelled from Darwin to Sydney, as part of our bigger London to Sydney overland adventure. First settled in 1861, this place is wonderfully quirky in every way—from Australia’s remotest traffic light to its award-winning pub that serves very cold beer and great food, has regular entertainment and the THONG TREE. For Australians, thongs are those rubber things you wear on your feet. But for much of the rest of the English-speaking world, thongs are those slingshot-style (and probably ill-fitting) underpants. On our overland road trips—with lots of English passengers—I get a kick out of using the word ‘thongs’ in almost every sentence. Do you like my thongs? Where are my thongs? I need to buy new thongs. My favourite thongs are green! 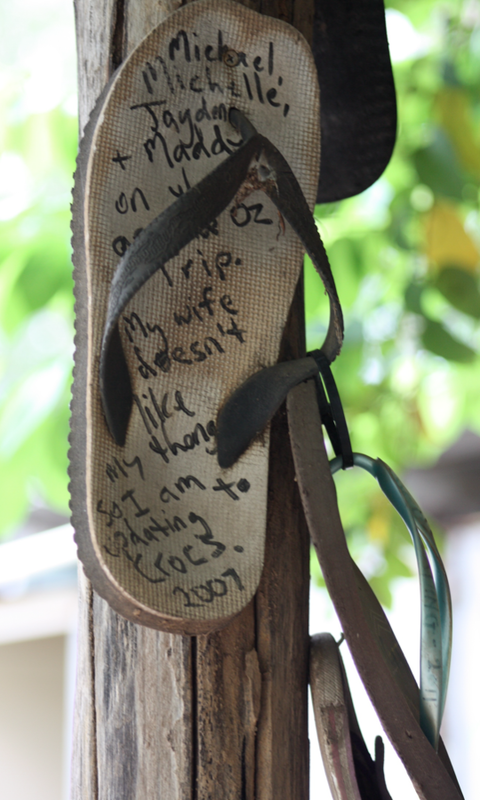 The Daly Waters Pub is well aware that thongs get a shellacking. They are misunderstood and underappreciated in many parts of the world, so out the back of the pub, and in support of the lowly thong, you can add your footwear to the heavily decorated tree. If you have some spare thongs to add (see the P.S. 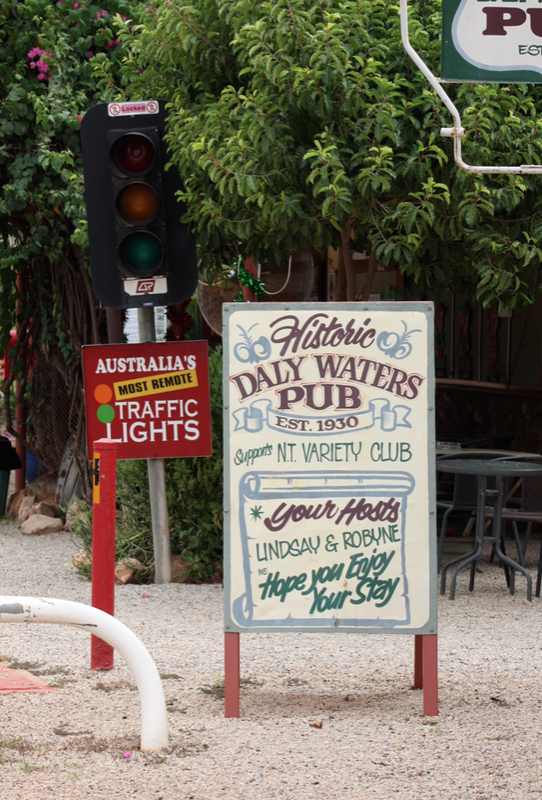 below for the background), you’ll find the Daly Waters Pub just off the Stuart Highway in Australia’s Northern Territory, which is rather fitting. The settlement was named by explorer John Stuart on his third attempt to cross the continent from south to north. He made it all the way from Adelaide to Darwin in 1862. P.S. In case you can’t read the Thong Tree poster, here it is. I’ve corrected the spelling. ‘Due to the introduction of exotic species such as reef sandals and the swedish masseur, the native thong which can be found throughout Australia has experienced a drastic reduction in numbers over the last decade. Good to know you left a thong in Daly Waters. I agree that 12 days going from Darwin to Sydney is rather quick, but I think our trip was better organised that yours. I felt like it was a sampler and that I could go back, which I have. Hi Andrea! The thong tree is hilarious. There’s lots of quirky and inventive things to see in Australia’s outback. When are you going to visit? I don’t have any definitive plans lined up, but I definitely intend to! When you do, we’ll be happy to show you around our little slice of the country—Canberra, the National Capital. G’day and thanks for highlighting such fun and unique places you and Poor John experience along the way! The Thong trees are funny…have seen them in other places, but not as unique as this one! 🙂 WHOO HOO! I’m glad to know there are more Thong Trees around. Love live the thong!